I've decided that Sunday is gonna be my day of choice to relax and talk pony. Cause, well... being a brony and all, if I don't talk about the show I'll surely explode! ...due to some technical difficulties encountered earlier I'm posting this now. I really enjoyed it! I must say that so far I love season two as a whole. There hasn't been a single episode that disappointed me. And the latest one might just be in my top 5. 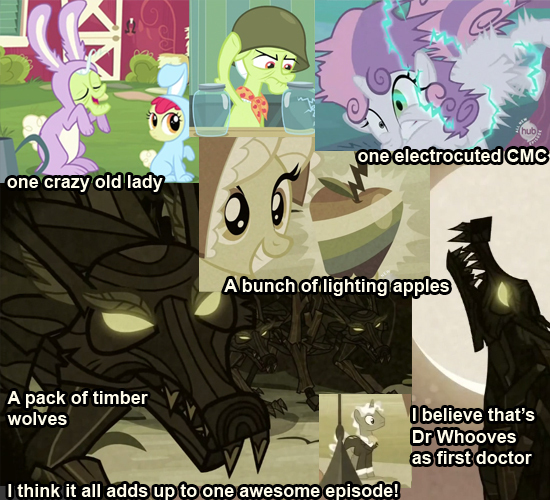 Zap apples are awesome! I absolutely adore this show for using mythological creatures the way it does and now it seems to be developing a mythology of its own as well. Studio B are definitely heading in the right creative direction. Or is it just me finding lightning-related things cool? Well, I'm happy either way! And speaking of mythology, there's also the timber wolves! How cool were they? I actually physically squeed like a little fan girl when I saw those, which hardly ever happens to me. Are they a reference to something or just one of the many clever puns found frequently in the show? Very Grimm Fairy Tales I think. Either way, if this hasn't been done before, it had to be done! A fantastic addition to the FiM's ongoing monster list if you ask me. It was nice to see an episode centred around Granny Smith, even though the lack of a solid AJ episode in this season is becoming a joke at this point. I quite like how it started with her being a crazy old lady Applebloom's ashamed of and then we got not only the reasons for all her strange actions, but also an interesting background story. Though it confused me as I assumed that Ponyville, Cloudsdale and Canterlot were founded at the same time, as covered in the previous episode. And I couldn't help but wonder what interest Princess Celestia had in checking out the Apple family's seed collection. Surely a bag full of random seeds is more of an assortment than a collection. And how do ponies starve when surrounded with grass? Am I over-thinking it? Perhaps. But what are bronies for after all. I also giggled at the fact that Diamond Tiara's dad is actually called Filthy Rich and his "I prefer Rich" response to being addressed as Filthy. One more thing I liked was a lack of a friendship report at the end of the episode. I thought that was a nice touch since it makes the show less predictable and we don't have to have Spike around each time (don't get me wrong, I like Spike. But I don't think he should appear just because a letter needs sending while there's nothing for him to do in the story). The lack of a report, however, didn't mean that nopony learned anything as Applebloom voices this week's lesson at the end. I like how natural that was. The Bronyville Podcast kept me sane while I was forced to spend hours upon hours in 3DS Max (I think I can actually say that I've learned to model though! Yay!). Go check it out. It's great! I was pleasantly surprised at how professional it is. The two co-hosts are very likeable characters, each with a fantastic sense of humour. And they tend to have awesome guests, too! Now Bronyville is my number one choice for keeping up with the fandom. EQD is great, of course, but I personally don't like the fact that you just end up covered with an avalanche of news posts and you'd have to spend hours on the site to go through them all and figure out what everypony's been up to. The Stars Will Aid In His Escape No one is safe from Rule 63 it seems. And though normally I don't pay much attention to gender swaps, this one has caught my eye. I'm liking the blocky and pointy armour here. I sense a certain Transformers vibe, which seems to fit pretty well. Mistress of the Eternal Night Very beautiful, nicely stylized. I think the artist has done a great job with the palette she's chosen to work with and I absolutely adore Luna's pearly skin as well as the starry mane. No Title. Still a great image though. It's a very cute animated picture. It takes me back to the days when we didn't know what Flash was and I was searching the web for pretty gif animations (Yep. Way back when Windows didn't freak out at the sight of those and kindly played them in the Windows Picture and Fax View). But that's enough nostalgia there. Go check it out. Very pretty, quite tasteful, the animation flows seamlessly from what I can tell and it has pretty twinkling stars, too. MLP - Happy Holidays Once again, not normally a big fan of humanized ponies. I really like this image though. The artist has actually taken care to preserve the characters' personalities and present the viewer with a likely-to-happen situation. I think the style is lovely as well. Makes me think of some children's books' illustrations. Party Hard This was just too funny not to share. Very well-done for what it is I think. Fluttershy's Lament When I first heard it I thought it was the most awesome fan-made track I've ever heard. I don't know if it was the sleep deprivation, the prolonged exposure to 3Ds Max or the fact that the song sounds different through speakers rather than headphones. I've downloaded it for my mp3 player and I've noticed it sounds a bit too harsh for me. But if you like Fluttershy, do check it out. Her voice is adorable and seems like the perfect choice for mixing. And yes, if you're not aware, the "Fluttershy is a tree" and "Scootaloo is a chicken" are both things in the community. And no, there's nothing more to back those up than Fluttershy saying "I'd like to be a tree" and Applebloom calling Scootaloo a chicken in the show. Mistress Zecora Moving on to a more sane choice of mine... The lyrics, the melody and the singing are all done reasonably well to say the least. In fact, it's much better than half the crap on the charts these days. Or is that not saying much? Either way, check it out. I have downloaded this song as well and I love it. I have however got my eye on one. "Canterlot Follies" by LadyMoondancer looks like great fun to me. It's something I've never expected to see : a MLP and "Jeeves and Wooster" crossover. I haven't started reading it, but I have glanced over it a few times and, to my absolute delight, it looks very well written. Can't wait to start!